The Moon orbits Earth in an elliptical orbit (not a perfect circle), hence the distance of the Moon from the Earth varies throughout the year… from between 356,500 km (221,500 mi) at the Perigee and 406,700 km (252,700 mi) at the Apogee… a variation of 50,200 km (31,200 mi). When a Full Moon or New Moon coincides with being Perigee (closest to Earth), it is deemed a SUPERMOON. Conversely, when a Full Moon or New Moon coincides with being Apogee (furthest from Earth), it is deemed a MICROMOON. The term supermoon is not used within the astronomical community, which uses the term perigee-syzygy or perigee full/new moon. Perigee is the point at which the Moon is closest in its orbit to the Earth, and syzygy is when the Earth, the Moon and the Sun are aligned. Please refer to our Monthly Celestial blog post during 2018 for a detailed energetic overview of each SUPERMOON throughout the year. Please also refer to our CELESTIAL Events for 2018 – Lunar, Solar & Astro Table for an overview of all transits for 2018. Referring to the images right (click to enlarge), around each Full Moon and New Moon – when the Sun, Earth & Moon are located more or less on a line in space – the gravitational pull on the Earths Oceans are affected, hence the range between high and low tides is greatest. These tides are referred to as SPRING TIDES. During a SUPERMOON, due to the Moon being especially close to Earth, this alignment and greater gravitational pull of the Moon on Earths Oceans accentuates our Spring Tides even more… giving us an even HIGHER High Tide and an even LOWER Low Tide than normal. These amplified tides are referred to as PERIGEE SPRING TIDES. It is unlikely that Perigee Spring Tides will cause flooding… unless of course the tides are associated with a strong weather system. But it is interesting to note, that historically after a SUPERMOON (either Perigee Full or New Moon), strong correlations have been drawn between SUPERMOON energy and Earthquakes, Storm Cells & dramatic changes in weather patterns. 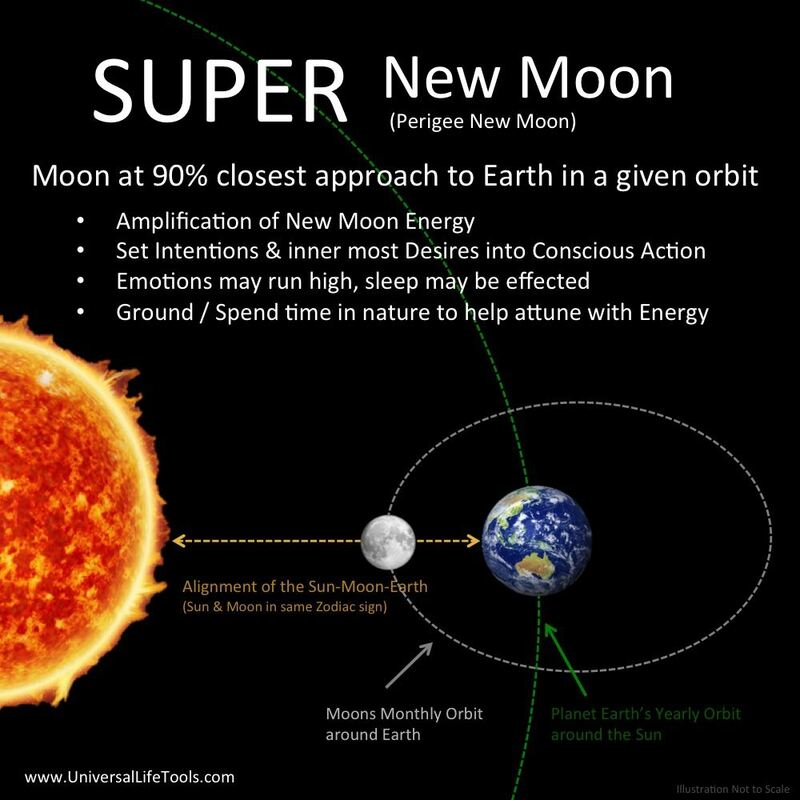 Whilst Super Moons have been shown to affect the tides above, just like the Earth’s Surface humans are also made up of over 70% water… hence the gravitation pull of the Moon also affects us ! 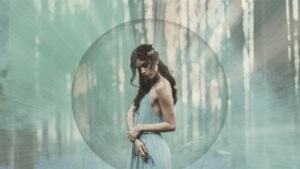 SUPERMOONS ‘amplify’ and affect our physical, emotion & mental states of beingness. Based on the SUPERMOONS alignments with other planets, constellations & energetic bodies within our cosmos.. as well as the SUPERMOONS position within our own Astrological Charts, SUPERMOONS affect each individual differently. 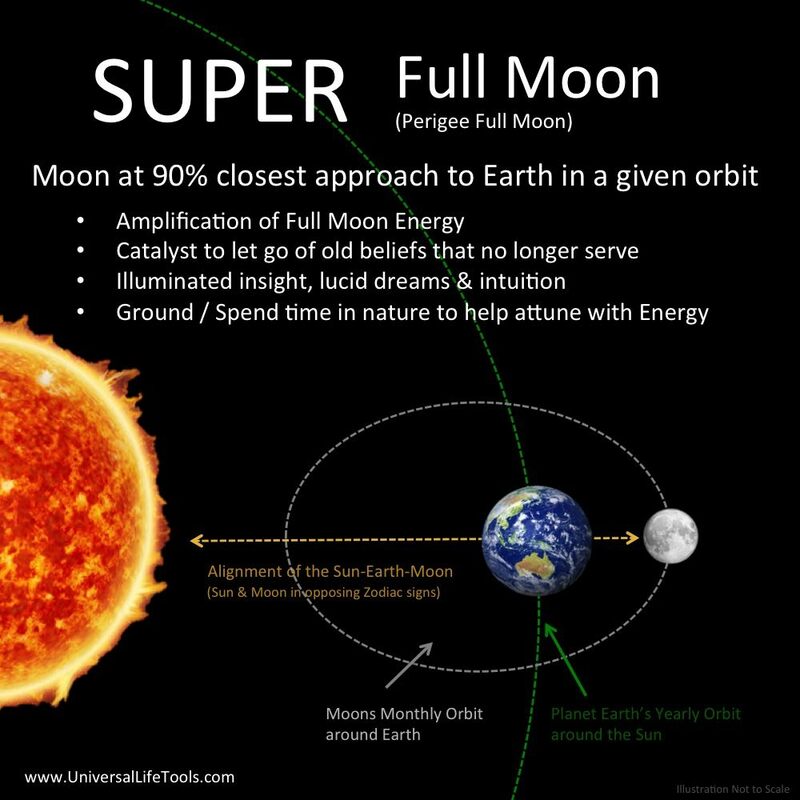 But what can generally be said is that SUPERMOONS are amplifiers of our energy fields and awaken higher potentials of the current planetary alignments that they are associated with. Energy runs high during a SUPERMOON… you may feel more emotional, electric, experience sleep disturbances or have expressive / lucid dreams. You may also find your intuition is heightened, synchronicity more pronounced and you become more aware or sensitive to the energy of the environment / people / plants / animals… actually everything ! The best way to balance with this highly charged energy is to Earth yourself by walking bare foot on the ground, hiking in nature, swimming in a lake or the ocean or connecting with Crystals / Earths Crystalline Field. Does a Super Moon look different ? 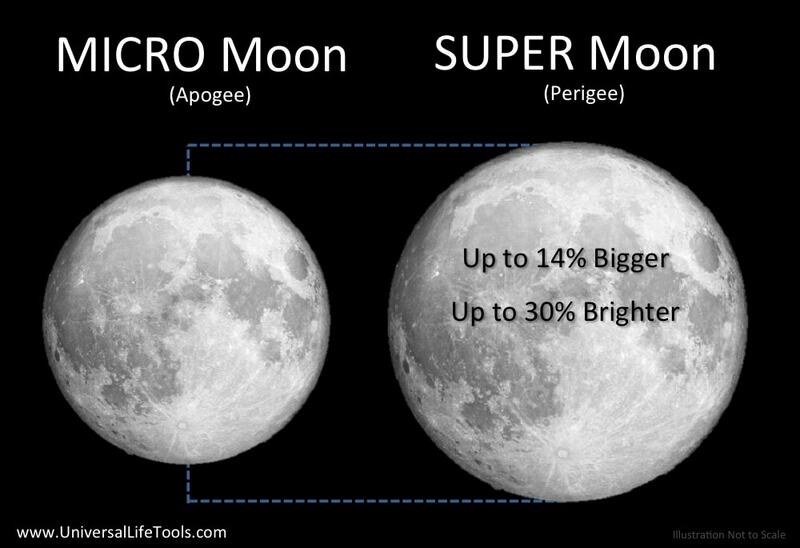 When comparing a SUPERMOON to a MICRO Moon, the Moon’s luminosity will be up to 30% brighter and the Moon will appear from Earth to be up to 14% Bigger. A MICROMOON is the Astrological term for the Moon (New Moon or Full Moon) when it is the furthest away from the Earth. Astronomers call these moons ‘Apogee Moon’ meaning ‘away from Earth’. Micro Moon is the term used by Astrologers, but Astromers refer to this as a ‘Apogee Moon’. This years MICROMOON will fall on the 27 July 2018 (less than a day before the 28 July 2018 FULL MOON). On the 27 July 2018, the Moon will lie about 406,222 km from Earth, compared with the closest FULL MOON SuperMoon on the 2 January 2018 at 356,846 km from Earth.